It’s a new toy onslaught in the new year! 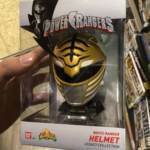 Found by @TheKennGlenn at GameStop is none other than the Legacy Mighty Morphin Power Rangers 1/4 Scale Helmets. These ring up for $22 and the assortment contains both the Mighty Morphin White Ranger and Mighty Morphin Red Ranger. Found by @TheKennGlenn. Ring up $22. Assortment (should) contain MMPR White and MMPR Red. Happy hunting.